The EduCare Mark demonstrates that our customer is accessing essential duty of care and safeguarding training and that that organisation is committed to creating a safer environment for children, young people and adults at risk. 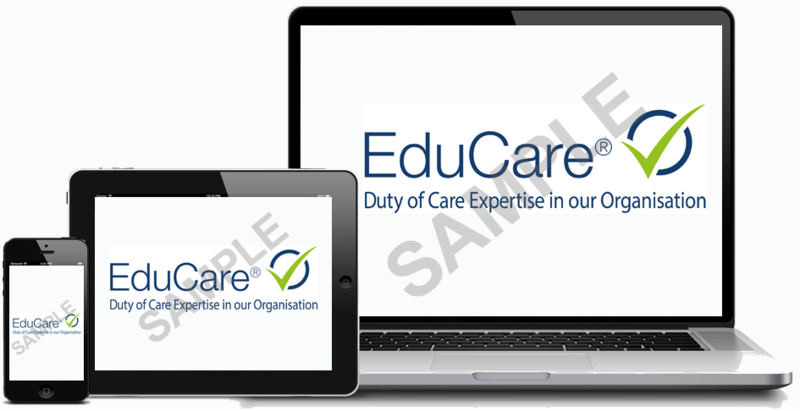 By displaying The EduCare Mark, you can be confident our customer has access to our high-quality safeguarding and duty of care e-learning courses, which have been written and endorsed by experts. What are the benefits of EduCare training? EduCare courses are designed to help any organisation create a culture of vigilance and will ensure staff know how to act if they are concerned. EduCare work with key organisations such as RoSPA, West Midlands Ambulance Service and The Police ‘Secured by Design’ Service who endorse and approve our training. The EduCare service ensures learners are kept up-to-date with current legislation, statutory guidance and best practice, with content updated whenever legislation changes. EduCare training content has been written by experts including charities such as anti-bullying campaigners, Kidscape, and YoungMinds, the UK’s leading charity championing the wellbeing and mental health of young people. The EduCare Mark is not an endorsement of any products or services provided. The EduCare Mark is not a qualification or accreditation and does not imply that any standards have been met. The EduCare Mark is not an assurance/guarantee that staff have taken, or passed, EduCare training. The responsibility to ensure staff meet legislation requirements or standards lies with the organisation. Links should not be interpreted as an endorsement by EduCare for those linked websites.